Making a mei tai is such an involved project that I get a high every time I finish one. It’s so great to see this wonderful creation that is not only beautiful, but functional as well. I smile just thinking about these pieces of fabric that I put together being used to snuggle babies close to their parents, right where they belong. I delivered this one today. The fabric is by Tina Givens for Free Spirit, and I used the exact same print in a different color once before, when it was requested by friend, Liz. The blues in the fabric look lovely paired with the gray canvas for the straps (in my opinion). And here’s a close-up of the print, called magical forest. It’s just so much fun. 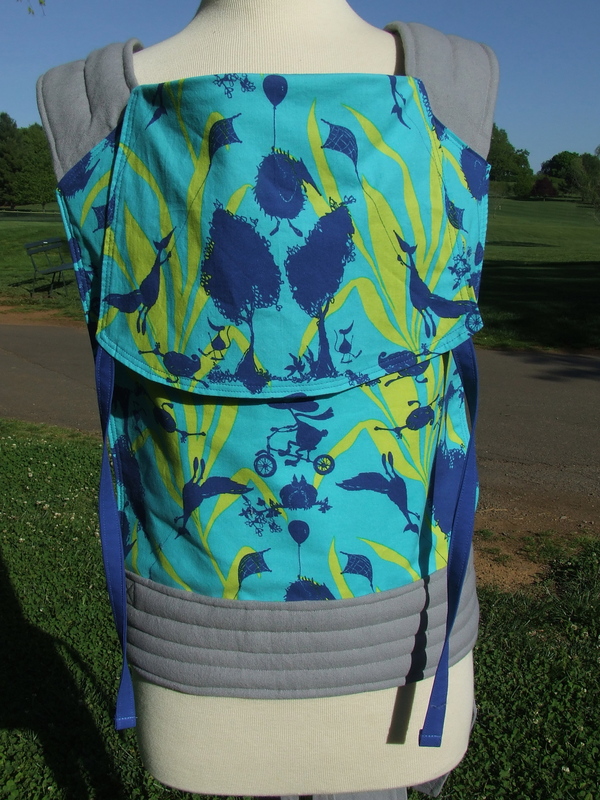 There are some places where I really try to pay attention to details, and I often try to match up the print of the sleeping hood with the body of the baby carrier, especially when using a large scale print like this one. You can see the two lines of top stitching along the edge of the sleeping hood where it falls against the body of the carrier. That double row of top stitching is repeated all the way around the carrier. The reverse is a solid blue, and the mei tai can be worn with either side facing outward. 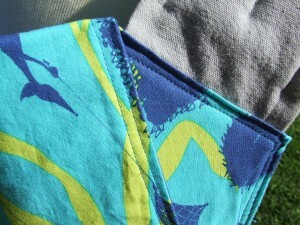 This blue picks up on the blue in the print and I think it looks awesome against the gray straps. I hope the new baby and the parents get lots of use out of this!